I know I’ve made a big brouhaha about this whole moving thing. Yes, it is a big deal to buy a house (I have to pay for water, garbage, and taxes? How’s this a good deal again? ), and it is a big deal to finally move to the ‘burbs. Yes, that squiggle that resembles France is supposed to be Iran. Also, I numbered the really large moves, and didn’t bother with smaller ones. And as you can see, I ran out of room on my large Moleskin, so I had to continue writing the U.S. cities on another page. My parents finally bought a house and set down roots when I was a junior in high school. On the one hand, it’s amazing that they went from immigrants who came here without anything to owning a home after eight years. On the other, those eight years meant a lot of moving on our part. One interesting aspect of this is the nature vs. nurture argument. Apparently, siblings who grow up in the same household and are exposed to the exact same experiences have vastly different reactions to them. My sister decided she hated moving. She moved up to Berkeley to go to Cal when she was finished with high school, and has stayed in Northern California ever since. She moved a couple of times in Berkeley, and lived in San Francisco when she was in law school, but she’s pretty much NorCal through and through. I somehow decided that moving would be my thing. I ended up moving many many times more. For people who aren’t super visual and need more detail regarding the whole moving thing, here’s a complete list. 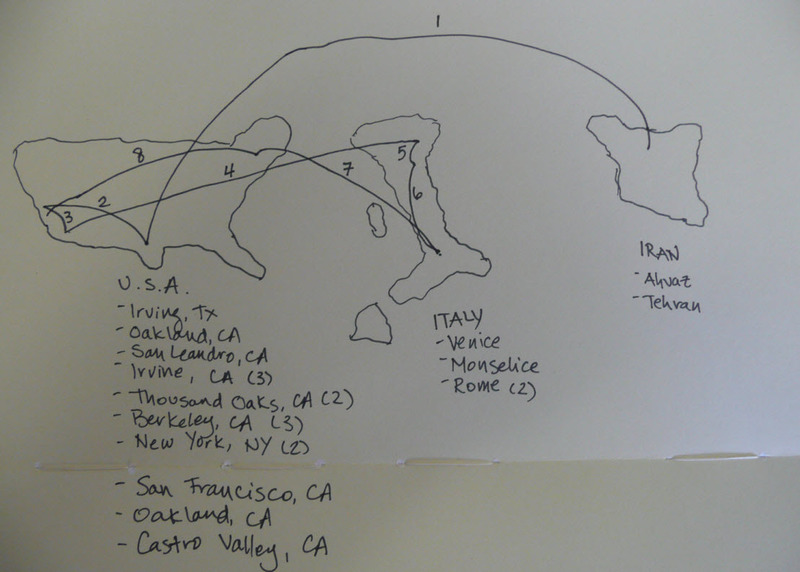 I’ve also included all the cities I’ve called home in each country, and the number of times I/we moved within those cities (in parentheses). Phew. It was exhausting just writing that. I could give military kids a run for their money. A, on the other hand, had moved once (once!) before he met me. His parents moved two street away from their original house when he was a teen. His mother still talks about their original house as casa mia and her current house as casa nuova. After twenty years. Italians don’t move much, or at all. They live with their parents until they get married, at which point they move out. Renting? That’s just for poor folks and students (synonymous, right?). In fact, people move so little that when you see a posting in Italy for an unfurnished apartment, it means that there are no kitchen cabinets or appliances. You have to buy an entire kitchen to move to an apartment in the Olde Country. Since we were married twelve years ago, A has had the pleasure of packing and unpacking boxes many a time. His mother affectionately refers to us as zingari (gypsies). But he, too, is tired. To be honest, I want P to have a childhood closer to A’s than to mine. It’s not fun to change schools a million times and have to make new friends. It really isn’t. Maybe all that moving made me the super-friendly, super-fabulous, super-interesting person I am today (pat pat pat on the back). But maybe I would’ve been just as friendly and fabulous without the moving. And I could answer the inevitable, “Where are you from?” without having to take an hour to explain the above spiel to the poor person who dared ask such an innocent question. It’s not even October yet (hell, it’s not even September yet) and I’m already starting to fret about Halloween. I can’t help it. Halloween is my least favorite holiday. Ever. I should say that my first ever Halloween started off with a bang. Twenty-five years ago on October 31, my family immigrated to the United States. We left war-torn Iran, packing all our necessities into a few suitcases, and literally left in the middle of the night without telling anyone (except close relatives) where were going. We flew to Rome via Frankfurt (on Lufthansa, my father’s favorite airline because 50 years ago a flight attendant gave him a dry cleaning ticket after she spilled a drink on him). For some reason, all Iranian citizens who want to immigrate to the United States have to handle all their paperwork through the American Embassy in Rome. And so we started our journey into the strange new land amidst cobblestone streets and visits to Pompeii. I celebrated my ninth birthday in a hotel room and blew out the candles on a beautiful cake—only to be sorely disappointed at my first bite of the liquor-drenched confection. And after ten days of bureaucratic craziness interspersed with incredibly normal tourist activities (and meals consisting of rotisserie chickens and Fanta), we finally made our way to Dallas, Texas, to the home of an aunt. We landed on U.S. soil on October 31, 1986. The sight of people dressed up as cowboys and Indians at the airport was strange and unforgettable. So unforgettable, in fact, that the airport scene was the intro to every college essay my sister wrote. It served her well, too—she got into Cornell and Berkeley only four years after coming to the U.S. without knowing a lick of English. Sorry, had to brag on her behalf. But when we got to my aunt’s house, there was an even better surprise: candy. Strewn everywhere. On the welcome mat, in the entryway…everywhere. I could get to like this new country. And I had no idea what the heck Halloween was. And who wants to admit that to new friends in fifth grade? Without any help from Google, I figured out that it was a holiday that required one to dress up in a costume. At the time, my incredibly educated father and mother were working in a gas station and washing lab implements, respectively, so it wasn’t really the time to ask for an extravagant costume. So I did what any imaginative kid would do: I raided the house and found something I could use for a costume. I studded an old sweater with as many safety pins as I could find, and went to school in my “costume” as….well, I’m not really sure. A kid in a safety-pin-studded sweater, I guess. As far as I remember, the day in school went off without a hitch. But I had no idea about what was yet to come: trick or treating. It turned out, neither did my parents. The stream of kids coming to the house either made them nervous or uncomfortable, and perhaps both. We turned off the lights and pretended we weren’t home. We didn’t have any candy to hand out. Why were little kids begging for candy, anyway? What was wrong with this country? Since then, I’ve lived through 23 Halloweens (but who’s counting, right?). Eight were spent in Italy, so there was no worrying about costumes or stock-piling candy. In Italia, October 31 would come and go just like any other day of the year. I can’t say that I have fabulous memories from the remaining 15. There was the one year when I was an undergrad at Berkeley, when my friends and I went to the craziness of the Castro party in San Francisco. What I remember the most about that night was running at breakneck speeds so we could catch the last train back to Berkeley. At parties, I’m generally the annoying girl without a costume, saying I’m dressed up as myself. That is, if I’m even invited to a Halloween party. A is no help whatsoever with this Halloween quandary. Since he didn’t grow up in the U.S. either, he doesn’t understand what the big deal is. And since he has a Y chromosome, he’s not crazy about chocolate. So Halloween really says nothing to him. Last year was P’s first Halloween, and it was probably the most memorable to date. I splurged and bought her an adorable ladybug costume. We dressed her up and took her to my sister’s house to show her off. Then we went to a pumpkin patch, where we took her picture with a gazillion pumpkins and in a pumpkin chariot. We looked just like a typical, All-American family. And that night, when trick-or-treaters came by, I opened the door, made appropriate comments about their costumes, and doled out handfuls of Kit Kats and Snickers. Oh, the lessons had been learned. I have to admit that a part of me still cringed every time the doorbell rang. In a few years, I look forward to accompanying P in her first trick-or-treat adventure. If I act uncomfortable doing it, it’s because it will also be my first time going trick-or-treating. As you may have noticed, I changed the name of the blog. Same look, same feel, same sparkling wit—just a new name. I thought an explanation was needed, so here it goes. I named Baby Ghetto Gourmet when I was pregnant and unemployed. Not that there’s anything wrong with either of those things, but at the time I was making on-the-spot decisions without much forethought, pretty much due to the emotional ups and downs that come with pregnancy and unemployment. And I had just seen Julie & Julia, and thought that having a food blog would be so cool. Silly me, I didn’t realize that everyone else thought having a food blog would be so cool. So the change to Third Culture. Why Third Culture, you may ask? I first heard the name from a friend and former coworker, CE, who had taught high school to expats in Austria. Apparently, it’s a term for kids of expats who grow up all over the world, and at some point lose a sense of belonging to their “home” country. The State Department website has a pretty extensive description of it. Well, when I was preggers and unemployed, I’d meet up with CE (also unemployed at the time, though he wasn’t pregnant) once in a while, where we would discuss our idea for a TV show, which in our mind would be called Third Culture. Since then, I’ve thought a lot about the term, and wanted to make it somehow mine (CE doesn’t mind—I already asked his permission). I thought the term was much more representative of what I wanted the blog to be about. Neither I nor A were born in the U.S. He moved here from Italy as an adult, and I moved here from Iran when I was 9. But my 20s were spent in Italy, so I have spent almost half of my life living on non-American soil. I carry and American passport and an Italian passport, but don’t feel like either fully represents who I am. I don’t have an Iranian passport, but you can’t really shake the culture in which you were born. So I’m neither here nor there, nor the other place. A carries an American and Italian passport, but definitely feels more Italian than American, and rightly so. Now we have a daughter who was born in the U.S., but into a family that is going to be somewhat different from her friends’. She’ll have the advantage of amazing fusion cuisine, and will hopefully have tri-linguist tendencies. But she will also have to deal with parents who don’t know all the words to Twinkle Twinkle Little Star and never took PB&J to school for lunch. So I hope the new blog name will inspire me to post about the challenges and joys of this aspect of parenthood. Although I will probably still write about my favorite recipes, cool buildings, and random things that have nothing to do with the Third Culture culture.